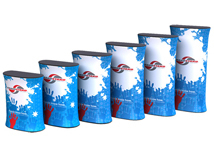 Trade show tables, counters, and chairs are great additions to any trade show booth. 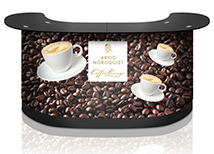 They are practical and stylish making your booth more functional while adding style. 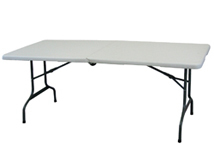 We offer folding tables that can be combined with any of our table throws to create a portable trade show table. 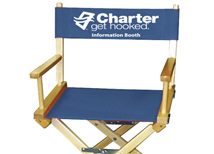 Our directors chairs can be printed with your logo making them very unique. 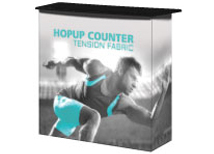 We offer multiple trade show counters that are designed to make your booth look professional while adding functionality. 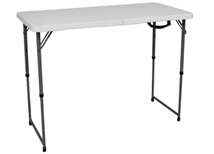 Our trade show tables, counters, and chairs are all stocked locally and ready for quick shipping. These trade show accessories will make your booth look more professional and provides useful storage and work space which will help your exhibitors manage leads and work with clients. 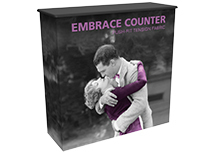 All of these accessories are highly portable and can pack down into shippable sizes. 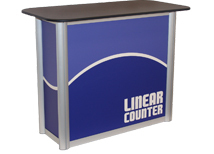 We once offered the v-class counter which is now discontinued, but we highly recommend the Linear counter in its place.